Faerieland slept, albeit loudly. It was unseasonably warm for spring, and there was the constant shuffle and mumble of people tossing and moaning and throwing off their covers and then regretting it. The still, humid air was sliced by what could only be described as a loud honking noise coming from the castle. Queen Fyora had gained the nickname "Lumberjack" because the sound of her sawing logs was comparable to a chainsaw. The air over Jhudora's Cloud was thick and smoky, with a violently violent tinge and a pointless penchant for alliteration. The stinkflies, gleaming in the night like smelly, iridescent jewels, excreted their foul stench with enthusiasm. The ooze toads oozed, hence the name, and what the kerflesch fish did will not be gone into to protect young minds. In the middle of it all, on a wrought iron bed, Jhudora slept. She fussed and groaned in the heat and clung to her Blumaroo plushie. "Oh... Mr. Cuddlefluff... I wuv you," she murmured into his worn, soft belly. She shifted, kicking her feet a little. Suddenly, Jhudora's foot brushed against something small and soft, with multiple legs. The search engine of her mind took a few moments to put those elements together. With a mental click, Jhudora sat up, eyes wide, and shrieked. Well, that wouldn't do at all. Jhudora, Faerie of the Dark and Unpleasant, trembling before a little spyder? It would be like Sloth and that pink underwear fiasco. Throwing off the covers, she leapt out of bed and prepared to vanquish the arachnid. Dark energy crackled and danced along her fingertips, though the image was somewhat ruined by the fact she was barefoot and in a nightgown. She stared at her bed in the gloom. There! There was a flash of darkness, quite a sight to see except no one saw it, and the sizzling smell of burning rubber. Jhudora sighed, plucked the molten mass of fake spyder from her bed, and tossed it over her shoulder. Of course. It was the night before April Fool's Day, and she was fair game. Grumbling about the lack of respect from kids today, Jhudora went back to bed, pulled the covers over herself, and froze. Someone was standing at the foot of her bed. She sat up again and peered into the shrouding darkness. There was a Faerie at the foot of her bed; that was obvious by the tall figure, the smooth skin, and the large wings on her back. She wore a silvery mask over her large, pale eyes. A large jester's cap, silver and black with tassels carrying dangling silver bells sat on her head. Her brown hair was shot with silver streaks, as if beams of moonlight had been woven into the chestnut locks. Or something. Jhudora's brain got disturbingly poetic when she was tired. The mystery guest wore a dress in a colour that if you don't know by now you need to check out Neoschool sooner rather than later. "...Who are you?" Jhudora asked, trying to control the high-pitched squeak in her voice. This Faerie was unfamiliar to her, and Jhudora didn't like unfamiliar people who infiltrated her cloud, put bugs in her bed, and watched her sleep. They generally were people who had bad intentions, and some of them were door-to-door salesmen, which were people with bad intentions and an excuse to use them. "I am the April Fool's Faerie, Jhudora," the Faerie said, smiling. Jhudora groaned. "If this is a joke, it's a bad one." She relaxed, and leaned back against her headboard, still warily watching the April Fool's Faerie. "So..."
Jhudora got the feeling that this would be a long night. "Were you just going to watch me sleep, then?" The Faerie grew serious. "I am the spirit of April Fool's day, Jhudora. I've watched over Neopia as it celebrates this holiday, and the only person who I am not satisfied with is you. You pull nasty tricks and malicious pranks. You take this wonderful day and exploit it for your own gain. I am disappointed." Jhudora flared her wings. "See these? Purple. Bad. Dark Faerie. Nasty person. Where does it say I promised to be a good little girl?" "I believe Queen Fyora knows the answer to that." Jhudora grew stony-faced. "That is between the Queen and me. Besides, I don't think Fyora really cares if I pull some harmless pranks on a few unlucky Neopians." The April Fool's Faerie's silvery eyes widened. "Harmless pranks? Oh, I think what you've done over the years has been less than harmless. Come on." The Faerie waved her hand and Jhudora was dressed and out of bed, looking annoyed. "Let us fly, Jhudora, and see the consequences of your 'harmless pranks'." Spreading her wings, which were smooth and curved elegantly, the silver Faerie hovered into the night sky. Jhudora reluctantly followed her, and they flew off into the night. Jhudora spoke. "Where are we going?" Jhudora scowled, invisible in the darkness. "Why not?" The sombre mood of the April Fool's Faerie dropped. "Dunno. It just ruins the tension." "So does a half-hour flight with no movie. Where are we going?" They touched down on the far side of the Haunted Woods. Jhudora landed first and made to move for the trees, but the April Fool's Faerie waved her hand again and Jhudora felt a solid barrier preventing her from escaping. She sighed loudly. "Okay, what now?" The silver Faerie pointed at a small cottage nestled in the woods. It looked like a cake had exploded on it. It was a violent, sugary pink, with white trim speckled with blue dots. The windows were as overdecorated as only windows could be: lavender curtains, white windowsill, a pink and lavender plant dominating said windowsill along with a few tasteless knick-knacks (No one, no one, wants to see your big ugly coral with GREETINGS FROM MARQUA poorly spelled in large pink letters on the side). Jhudora winced as she took in the exquisite hideousness of the house. Whoever had decorated this place was a serious expert at blinding people and probably did it for a living. Worse still, the April Fool's Faerie was purposefully striding toward the purple front door. She knocked on it sharply three times, then motioned for Jhudora to follow her inside. The inside of the house will not be described. Suffice to say, there were pictures of running Unis and baby Kougras in baskets. As for the rest, use your imagination. Jhudora sat on the yellow couch and tried not to touch anything as the April Fool's Faerie descended into the depths of the house, returning moments later. With her was a tiny yellow Kacheek. She wore glasses thicker than King Skarl, had a mass of frizzy grey hair, and had a sad, lost look, as if she was on her way to the kitchen and would now certainly forget to eat. "So, Muriel, do you mind telling us what happened to your husband?" the April Fool's Faerie asked. Sniffling, Muriel nodded while Jhudora almost nodded off. "Well, one day about thirty-four years ago exactly, my husband Marty--"
"--George, thank you dear. Cuppa? No? Alright then." The Kacheek cleaned her glasses. "My George got a tip that there was gold on Kreludor. George is an intrepid fella, yes, and he said to me, 'Muriel, I wanna find this gold!' Naturally, I advised him against this, this fool plan, but he wouldn't listen to me. He hopped off on a spaceship to Kreludor, poor Fred--"
"S'what I said! Poor Fred hopped off an a spaceship to Kreludor and I haven't seen him since. Every Day of Giving he sends me a letter and a moon rock with a sliver of gold in it. I miss him every day, I do. I wish he would come home, but he says he's really close to a big deposit now. I suppose whatever makes him happy, but still--" she sighed, then, quite possible forgetting about her husband, brightened up. "Do you gals wanna meet Rohane?" Without another word she quickly shuffled out of the room. "So, Jhudora," the April Fool's Faerie asked. "Who do you think gave Marty--"
Jhudora grinned wickedly. "Guilty as charged, my friend. Ooh, that was a doozie. I remember it as if it were thirty-four years ago." At that point Muriel returned, leading three or four Meowclopses. Eagerly they climbed up onto the couch and started sniffing Jhudora and fighting for a position on her lap. Alarmed, she tried to get up, but the squirming furbags overwhelmed her. "That's Rohane there," Muriel said, pointing. "That's Mipsy, and those those two are Velm and Talinia." Jhudora stared imploringly at the April Fool's Faerie. "Can we go? Now? Before I discover I have an allergy?" "Fine." The silver Faerie stood up, helped Jhudora get to her feet and walked toward the door. "Goodbye, Muriel, and thank you. I hope you have a nice day." The old Kacheek nodded tiredly. "No problem, George." She was asleep before they shut the door. Outside was still dark. Dawn was a few hours off. Jhudora stretched and turned toward her guide. "The point of that was..."
"To make you realize the error of your ways and stop with the nasty pranks." "...Oh. You should have told me that before we went in, I would've paid more attention." The April Fool's Faerie counted to ten and flapped her wings. Jhudora groaned. "More flying? It's late. And I have a full day tomorrow." "So if the guilt angle didn't work, I'll try the threat angle." The April Fool's Faerie grimaced as she landed on the stone windowsill of Meridell Castle. She grabbed Jhudora's arm before she had time to land and yanked her inside King Skarl's chamber. As Jhudora tumbled to the ground, King Skarl awoke, instinctively grabbing a drumstick from the bucket on his bedside table. Jhudora rubbed her now bruised arm. "What is it with you and waking up violent people? Do you have a death wish?" "King Skarl," addressed the April Fool's Faerie in a loud, authoritative voice. "Tell my friend here, if you will--" Jhudora grimaced at the word 'friend'--"about what happened to you last year." Skarl moaned and rubbed his eyes. "Last year? Uh...last year my guard told me that there was an invader in the castle. We spent all day looking for him, and when I returned to my room my fried meat was missing! I was an emotional wreck." At this he bit into his fried meat. Jhudora smirked. "Good times," she murmured. "And what do you plan to do if you find who was responsible for this?" the April Fool's Faerie asked. "Oh, that's easy," Skarl growled. "First, we'll tie the intruder up in the dungeons, and throw rotten cheese at him, and then he'll watch me eat a whole bucket of fried meat." The king grinned, his eyes alight with rage. "Oh yes, revengeance will be mine!" Jhudora paused in her laughter. "Revengeance?" "Yeah, you know, getting back at someone." The April Fool's Faerie sighed. "This isn't working. Let's leave." She pulled the still giggling Jhudora out the window and headed back to Faerieland. "Seriously? Does disturbing people from peaceful sleep give you satisfaction?" Jhudora asked from her position near the window as the April Fool's Faerie gently nudged the slumbering Queen Fyora. "Quiet! ...Your Highness, if you could just wake up for a second..."
With a snarl, Fyora sat up in bed, eyes wild and furious. "WHO DARES DISTURB MY SLEEP?" she roared. "I'LL SHOW YOU UNLADYLIKE. WHAT DO YOU WANT?" "Well, Your Highness, I was hoping you could tell Jhudora that her pranks are having a negative effect--"
"JHUDORA. ENOUGH WITH THE TRICKS OR I'LL RIP YOUR WINGS OFF AND FEED YOU TO THE MEEPITS. GET IT?" "GOOD." Fyora waved her hands and a large, searing beam of fuchsia light hit the spot where Jhudora had been standing a second earlier. But she was already out the window, flying like mad, and did not stop until she was home. April Fool's Day dawned bright and crisp, and Jhudora was the first one up to celebrate. "Socks?" asked the confused Poogle, holding up the pink fluffy socks Jhudora had given her. "Yep!" Jhudora responded with a plastic smile. "Socks! Ha! Good one, eh?" As the Poogle scampered off the cloud she added, "Brat." "What was that, Jhudora?" The sound of Fyora's voice was unmistakable. "Er... nothing. Absolutely nothing whatsoever, I'm telling you." "That's what I thought I heard." Fyora stepped away to another section of cloud, watching as Jhudora confused the wary Neopians with disturbing kindness. "Think she learned her lesson?" 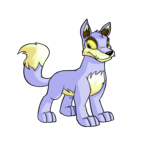 Fyora turned to see the April Fool's Faerie beside her, smiling broadly. "Of course not. But it was fun, wasn't it? And take off that getup. And whose idea was it to wake me up?" The April Fool's Faerie removed her mask, and with it her hat, dress, and hair all magically transformed. There stood Illusen, a mischievous gleam in her eye. "Oh yes, it was a lot of fun. Thank you for helping me with my prank, Your Highness." "No trouble, Illusen. Happy April Fool's Day." She had already solved the first problem in her mind, but she hesitated before she put it down on the paper. What if... what if she got a C too? Would that solve things?